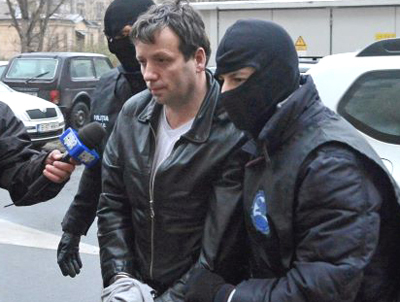 According to Romanian authorities, investigators have arrested a man they allege is “Guccifer,” the hacker who has spent more than a year bedeviling public figures worldwide. Agents with Romania's Directorate for Investigating Organized Crime and Terrorism busted Marcel Lazar Lehel, 42, during a raid today at his home outside Arad, according to a prosecution statement that accuses Lehel of "repeatedly" accessing "e-mail accounts belonging to public figures in Romania." Press reports described Lehel, pictured at right in custody, as a former cab driver who was convicted in 2012 of hacking the e-mail accounts of Romanian public figures. He received a three-year suspended sentence for those illegal online incursions. As TSG reported earlier this month, “Guccifer” hacked the Yahoo e-mail account of George-Cristian Maior, head of the Romanian Intelligence Service. Last year, the hacker broke into the e-mail account of Corina Cretu, a Romanian diplomat, and stole a series of personal correspondence between her and Colin Powell, the former Secretary of State. After accessing Maior’s account, “Guccifer” sent the intelligence official a taunting note (in Romanian) warning that he would release “all sorts of documents embarrassing about yourself” unless they could agree on a price for his 7Gb archive detailing his online rampage. “Guccifer” subsequently provided a reporter with links to a series of Google Drive files containing thousands of stolen documents, photos, and videos. Those records were reviewed for a January 6 TSG story further detailing the hacker’s crime spree. “Guccifer” also provided the Google Drive links to Cryptome, the anti-secrecy web site (which this morning posted those links).